SEO is an acronym for Search Engine Optimization — a marketing tactic whose goal is to generate better search results in engines such as Google, Yahoo!, and Bing. As with all websites, you rely on users typing in or searching for keywords and your website coming up in those results. There is a variety of simple strategies you can begin employing today with your Hits in a Box site to boost your visibility online. What follows is a summary of some of the basics. Keywords serve as a summary of a web page. Search engines use them to match a search query with appropriate pages. Choose a keyword or keyword phrase that best summarizes the content of each of your web pages. 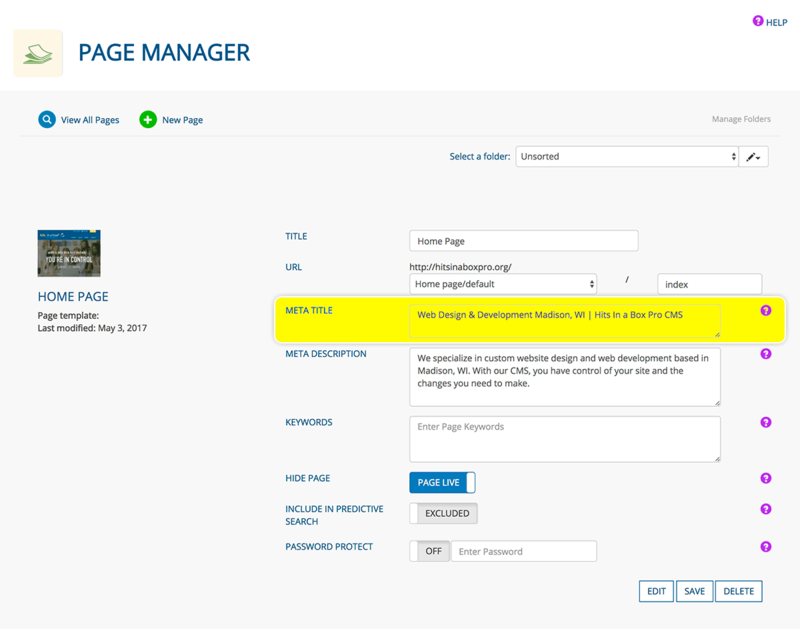 Enter the keyword or phrase in the FOCUS KEYWORD field when creating or editing a page through the Page Manager app. Include the keyword or phrase in your page copy, headings, image alt tags, and meta descriptions (don’t overdo it though; cramming your page with keywords can harm your SEO). Use terms users would use to find your business. Be creative and work your terms into sentences. Because all search results are based on relevant matching content, provide information within your website about the terms users are searching for. This is the percentage a keyword or phrase appears on a web page in relation to the total number of words on the page. In the context of search engine optimization, keyword density can be used to determine whether a web page is relevant to a specified keyword or keyword phrase. There is no ideal keyword density percentage. Your objective should be to NATURALLY incorporate keywords when writing page content. If you own an auto repair and sales business, and a keyword you want a search result for is “oil change,” include copy, images and supporting information about oil changes. Search engines will see you have relevant content about oil changes and will give you a search result for this content. Information about your experience, oil types, knowing when to change your oil, and your services related to oil changes are all examples of supporting content for “oil change”. This is the primary text that describes a page. A key SEO element, it should be concise and accurate, 50-60 characters in length, and include keywords. This is also the term that is linked from a search result. Each page should have a unique title tag that describes the page’s content with the most relevant keywords. This is the snippet of copy that shows up for a search engine result. A meta description provides a summary of a web page’s contents. It should be 150-160 characters in length. The meta description is essential because it is what users will see when they find the page via an online search — and likely will be a determining factor for whether they click the link that takes them to your page. Need new tires? You’ll find the best prices and value here. Don’s has been mounting, balancing, and installing tires for more than 50 years. We provide FREE rotations, and tire inspections. Alt tags contain the text that describes the images on a web page. Its primary purpose is to help those with disabilities who use screen readers when navigating the Internet. Alt text also can provide a boost to your SEO by including the keywords being targeted on the page. 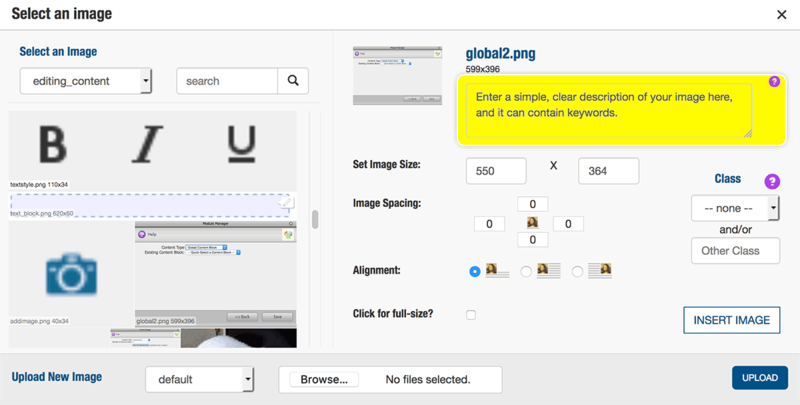 Alt tags also help the images on your website appear when a user searches for images. Enter your text in the GLOBAL ALT TAG field. Whenever you place this image on your site, the alt tag will be used.